On Monday, after a initial delay, the Ga-Rankuwa Magistrates Court began the process of releasing of Marikana miners who had been previously facing charges of murder and attempted murder. Outside the gates of the court, some of the first group of provisionally free miners told journalists that they had been tortured in police custody. By SIPHO HLONGWANE. After the police shot 112 striking miners at Marikana on 16 August, killing 34, they arrested 259 people and trucked them to various police holding cells in the North West and Gauteng. By 1 September, the number of arrested had increased to 270 following arrests in the squatter camp near the site of the shootings and of some people reportedly taken after being discharged from various hospitals in the area. During this time, the Independent Police Investigative Directorate (IPID), the police watchdog, received numerous complaints alleging that police were torturing the arrested men. On Monday, after being released from custody by the court following a decision by the National Prosecuting Authority (NPA) to drop the most controversial of the charges, several of the miners said they had indeed been on the receiving end of brutal violence while in police holding cells. Wilson Febane, a resident of Marikana and one of the first to be freed Monday afternoon, said that the police especially targeted those prisoners who used cell phones. “We wanted to use the phone inside, but the police, they just take us outside and they beat us. They punch, they kick us. They say don’t look at us. I don’t understand how long time, but they kick us out,” he said. 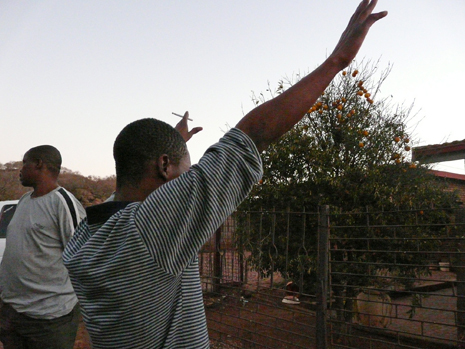 Another miner, who did not give his name, said that at the Bethanie police station in Brits he was made to stand against the wall with his hands above his head while the police beat him in the ribs with their bare hands and a stick. He witnessed others being slapped and having their fingers stomped on with boots. 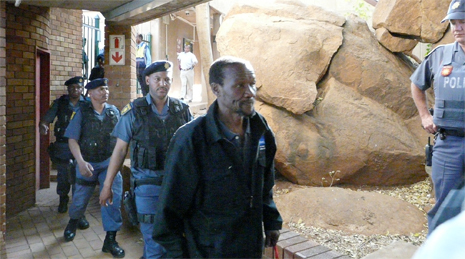 The prisoners were not mistreated at Pretoria Central Prison and the prison in Rustenburg, where they were transferred to after their first court appearance, two other men who had also just been released said. None of the miners who were injured were among those who were released on Monday, but another two men said they had been told those men would be released at a later stage. Though the police had shot 112 miners – killing 34 and wounding 78 – the NPA decided to charge the 270 arrested men with murder and attempted murder under the “common purpose” provision. The decision was widely panned in the public, and eventually the charges were dropped. 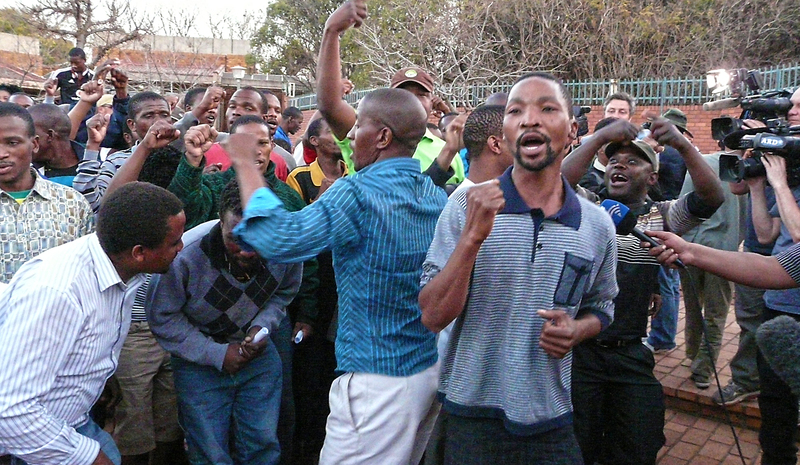 Due to an administrative mistake on the NPA’s side, releasing the miners from prison took most of the day, so that by 17:30 Monday, fewer than 50 men were actually out. Some 162 men were expected to walk free, while the state would continue to hold those whose addresses hadn’t yet been verified as well as those who were suspects in the murder of 10 people prior to August 16. The magistrate assented to the bail conditions asked for by the state. The miners may now not do anything that will be seen as violence, intimidation, interfering with witnesses, or contravening the Regulations of Gatherings Act, the Firearms Control Act and the Dangerous Weapons Act. Speaking afterwards, the freed miners said they would have to be careful not to be seen among the group of miners still on a wildcat strike at Marikana, lest they overstep the boundaries of their bail conditions. The prosecutor said police would take the men back to their homes, but the help was refused and the men got into 10 minibus taxis, allegedly provided for by Friends of the ANC Youth League, a group connected to Julius Malema. The defence lawyers noted for the record in the court that they believed all charges against the miners should have been dropped. The prison stint and the brutality at the hands of the police seem to have done little to stunt the demands of the men, though those we interviewed expressed almighty relief at being free at last. They will probably not rejoin the strike because their traditional weapons have been confiscated (and such an action might violate bail conditions) but the Friends of the ANC Youth League are carefully pointing their anger away from Lonmin PLC and to a new direction: President Jacob Zuma.